We depend on volunteers as museum docents and for special events and projects! Please contact via email “Volunteers” to info@rockfishvalley.org STAFF POSITION RVF was founded in 2005. Since then it has grown to provide the Rockfish Valley Trail System, Spruce Creek Park and the Natural History Center. All that has been done by a volunteer board of trustees, the Agelasto family and nearly 100 volunteers. We are in transition to where there is a turnover of trustees and the Agelasto family will take a lesser role. Over the past 6 months we have sought grants to support the first year of a part time managing director. The final interviews take place January 6. We have several excellent candidates and we hope to hire someone within our budget. At the same time we have new committee chairs for our trails, Spruce Creek Park, Finance and the like. We have a major collaborative effort underway with Nelson Schools but lack co-chairs for our education/program committee. There is lots of opportunity for community members to become involved. PIPELINE UPDATE - ARCHAEOLOGY AND MITIGATION You may not know that the ACP crosses lands of RVF in two places. 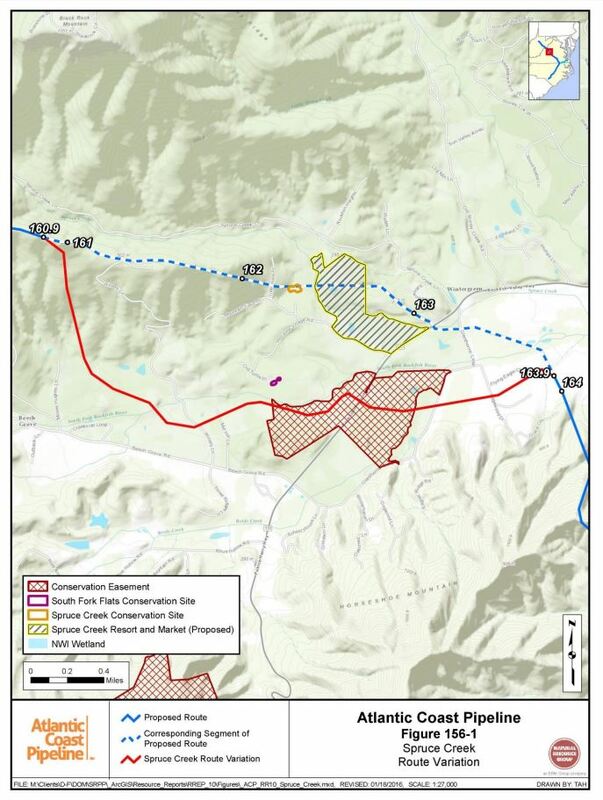 One has been determined by FERC to have negative impact on the South Rockfish Valley Rural Historic District we worked between 2009 and 2016 to have recognized. The crossing is at our archaeology site which we call the Coleman Mills in the old Wintergreen Village. As a result Dominion will be required to do mitigation if the pipeline project comes through. They have filed a proposal which includes archaeology at the site and other things. We want to have exhibits on the historic district and on the pipeline project itself. 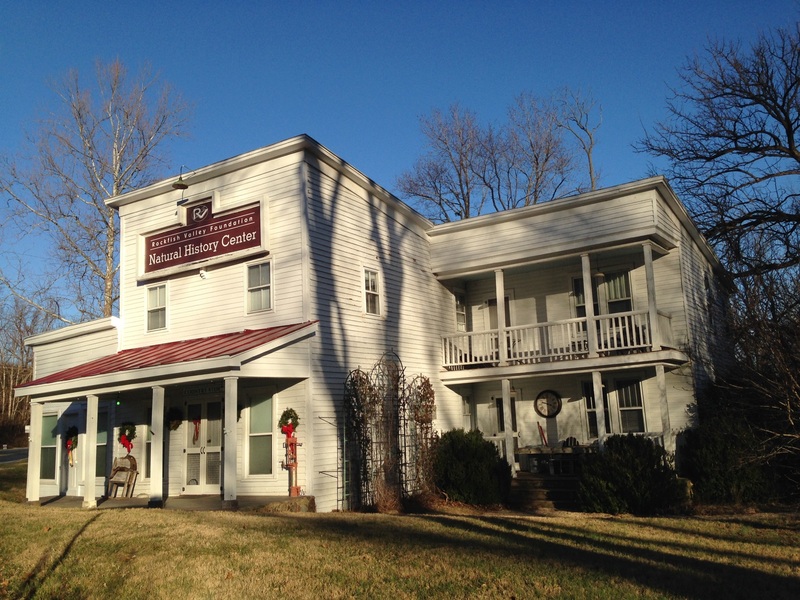 The museum at the Rockfish Valley Foundation Natural History Center is closed for the season except for special arrangements for groups. It reopens April 2, 2017. Please call ahead or look for an open sign. We have more than 40 volunteers who staff the museum. We are training new volunteers in February and March. Remember it has a great little gift shop and is always free and open to the public. RVF education committee now includes 12 people but we seek to add more members with experience in education. In addition we are the initiator in seeking a large multi year grant that would help create tool box support for the teachers not only in Nelson but in surrounding counties of Louisa, Fluvanna, Albemarle, Greene and the city of Charlottesville. A number of non profits are collaborating on this with goal to file for grants in spring 2017. Nelson Natural day will take place in May at Spruce Creek Park again with a collaboration of the Western Albemarle Environmental Academy. This supports the 4th grade at Rockfish Elementary. We have two programs on the calendar for the 5th graders at Rockfish Elementary. Arbor Day programs at both Tye River Elementary and Rockfish River Elementary are being considered if we find the capacity. We continue to seek interns for both projects and on a paid basis from the schools. Our connectivity with the Scouts has begun. We have two Eagle Scout projects under discussion. The recreational trail grant from The Dept  of Conservation and Recreation requires a 20% match. That is $6000. We do not have that in our operation budget. It allows us to seek reimbursement of $30,000 and complete the 11 projects. 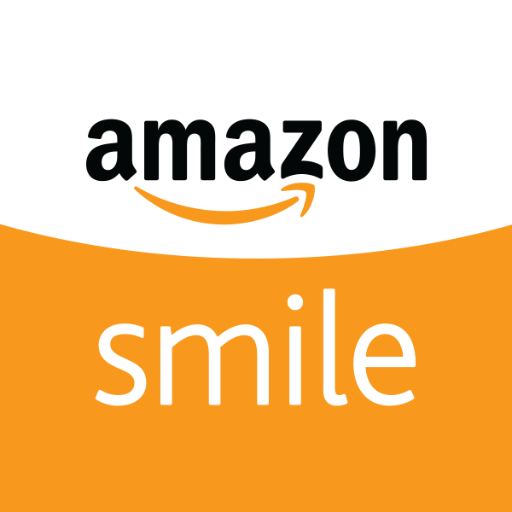 Would you please consider a special gift to provide those matching funds! Also, our fund drive is within $5000 of success and this eblast is the only request we are making  to seek donations for the budget and the matching funds. In 2017 we are outlining plans for a number of programs. Already approved is a program with Lincoln Brower on the Monarch Butterfly. We are so fortunate to have him in our community. The second is a party at another historic house in the district. The South Rockfish Valley Rural Historic District will soon receive recognition form Governor McAuliffe as a Virginia Treasure. Already there are those encouraging us to extend the district boundary just established. That takes a community conversation but we could pursue that. Let us know what you think. One boundary considered would be Reid’s Gap. 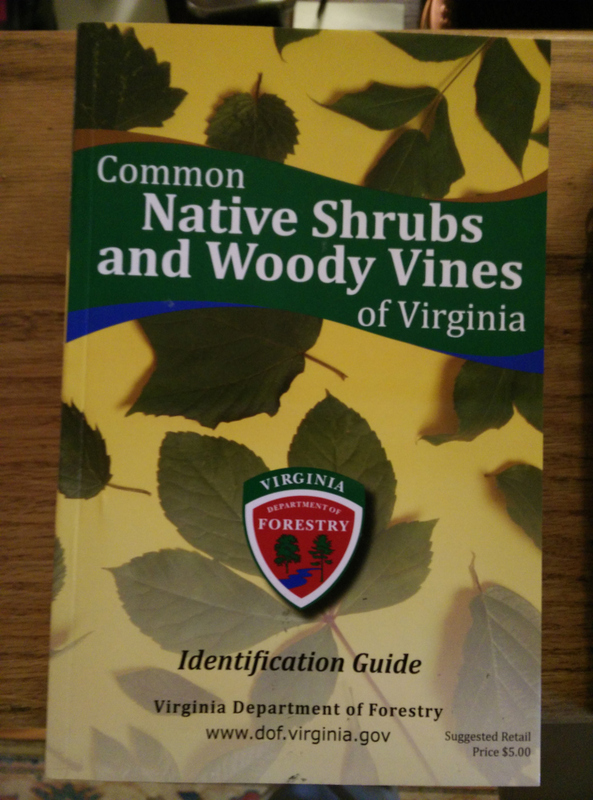 Probably the most Interesting program on the drawing board is an extensive one on invasive plants. It will involve PRISM of the Blue Ridge, VA DCR and USDA. We are assembling volunteers for that now if you are interested. It will be late summer. The last program is one on geology. Our Nelsonite program was a great success and there is obvious interest to learn more about Rockfish Valley Geology. Grants for Spruce Creek Park are being implemented. 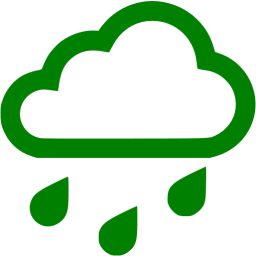 We have 11 small projects to improve the Children’s Nature Trail, the Native Plant Walk and the Wildflower Meadows. We always need additional funding and volunteers but the bones are coming together so well you should stop and take a walk. One of these should be completed each month and all finished by fall. P.S.- the huge amount of scraping, repair, priming and painting to the front of the building was done at no cost to the Rockfish Valley Foundation. Check it out. It looks wonderful. And no foundation funds were used to fight the pipeline impact on Rockfish Valley Foundation resources. the new Virginia State Rock ! We are presenting the who, what, where, when, and why of Nelsonite at Tuckahoe School on Oct 16. The space holds 90 people and we can reserve you a spot but otherwise it is first come first seated. On May 31, 2016, Governor Terry McAuliffe designated Nelsonite as the state rock of Virginia effective July 1, 2016. Here is a link to a Bureau of Mines document from 1970 which you can read to learn more about Nelsonite and Piney River and Roseland. (Bureau of Mines #1371). At the event we will have Lawrence Tiezzi, professor from PVCC who was behind the selection; state geologist, David Spears will also talk on the geology of the Rockfish Valley as well as Nelsonite; David Lipscomb from the Rock shop (RVCC) will talk about rock collecting; along with a few others will be presenting. Gene Hughes is a local historian and a wood woodworker. He has made lots of wood items which he sells at the farmer’s market. He created a special 10th anniversary item for the Rockfish Valley Foundation. It is a walking stick made of Nelson Walnut and Nelson Stag antler. People who attended the celebration of the historic district Sept 18 registered to win it in a drawing. The drawing sign up will continue until December when a lucky winner will be selected at our volunteer party. If you come into the Rockfish Valley Foundation Natural History Center museum you can register. You may also register at the Nelsonite event on October 16. Thanks Gene ! good luck – someone will win. INVASIVE PLANTS ARE GETTING WORSE AND WORSE. We think one of the major problems for the environment is the spread of invasive plants. RVF hopes to do more to educate about this problem in the future. We have just been introduced to a new organization in Virginia with which we hope to collaborate. It is the Blue Ridge PRISM which is a partnership for regional invasive species management. They have an educational website Blue Ridge PRISM. 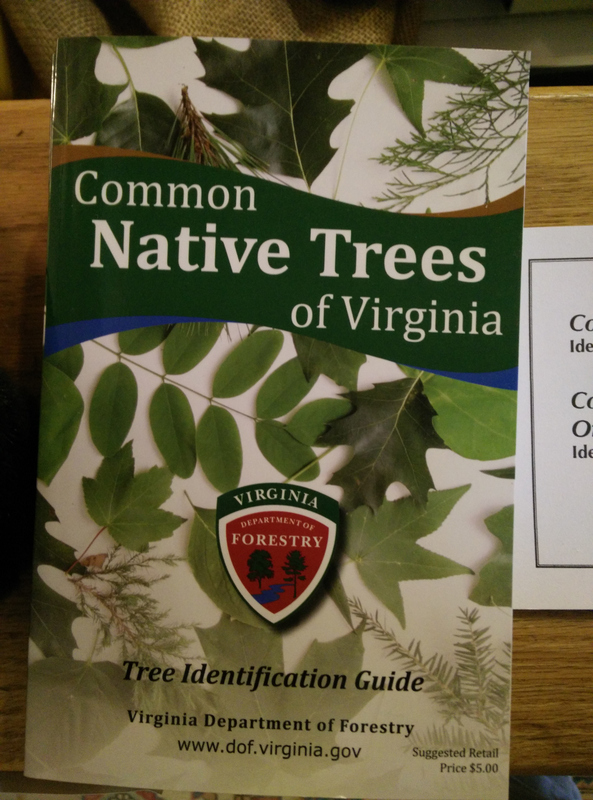 Landowner funding is provided through USDA Natural Resources Conservation Services located in Louisa, Virginia. They have just received almost $900,000 to disburse toapplicants in a 10 county area including Nelson (Natural Resources Conservation Service). If you have a farm you will be eligible for funding and consultation if you apply. There are 12 invasives identified as the ones to fight. 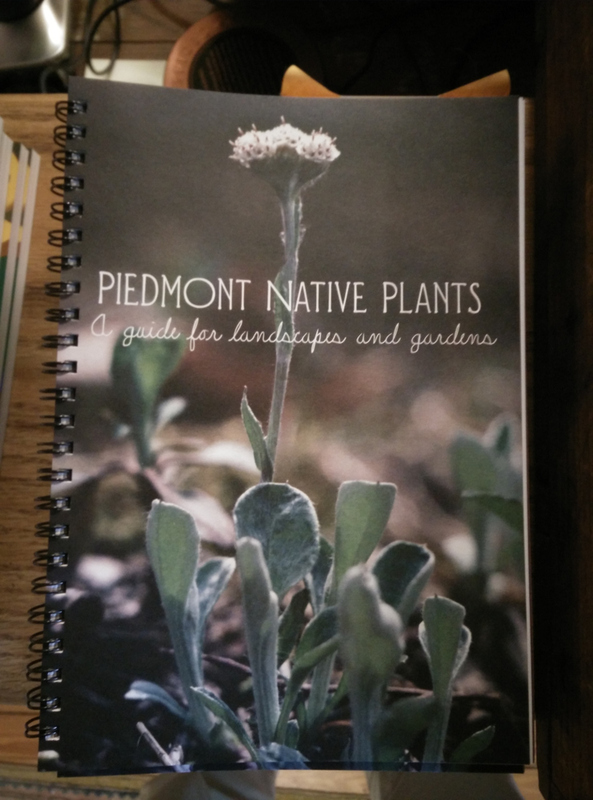 You know some of them: spotted knapweed, kudzu, ailanthus and lespedeza. Let’s learn and take action now ! ~ Dedication of the Rockfish Valley Birding Trails in September 2006 as part of the state wide system hosted by VA Dept of Game and Insland Fisheries. Design and installation of the Kids in Parks Trail affiliated with the Blue Ridge Parkway Foundation and the Rockfish Valley Geology Trail. ~ Rockfish Valley Foundation Natural History Center opened June 2012 affiliated with VA Museum of Natural History which plays host to thousands of visitors each year. Kids can become Rockfish Rangers and use our Camp Rockfish materials. For THE FUTURE our goals are to complete the Spruce Creek Park Children’s Nature Trail and Spruce Creek Park Native Plant Walk and connect their resources to those in the Natural History Center. Equally important we plan to enhance our Collaboration with Nelson County Schools and promote Nelson Natural Day, field trips, Education and Environmental Literacy. To do this we need to build capacity. That means to raise money, get more volunteers and to create partnerships with others. 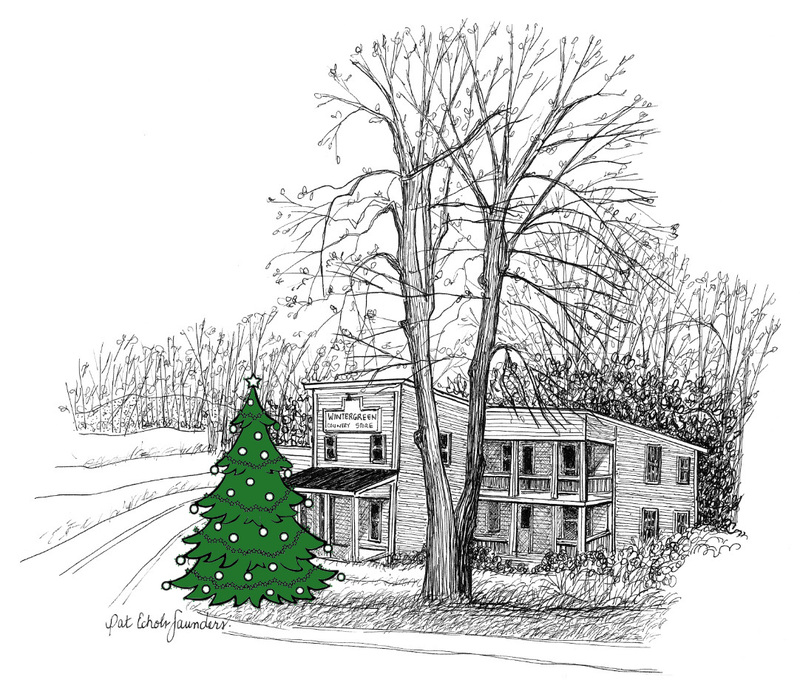 Please consider a gift this year to our fund drive. That will be announced in early October. Also please consider giving time as a docent so we can find the 12 docents to staff a Wednesday opening. You will begin to learn so much about our community. There is no paid staff and no funding from Nelson County. We are proud of our success and welcome your comments on what we can do better to serve our community. 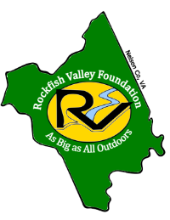 Please go to www.rockfishvalley.org to donate or volunteer. 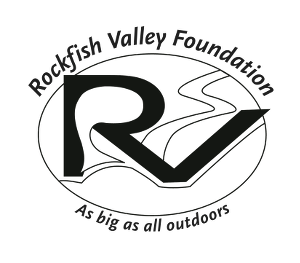 It’s our pleasure to bring you some news about RVF. 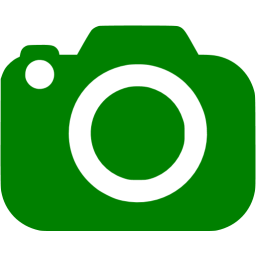 For this newsletter we will link you to added content. 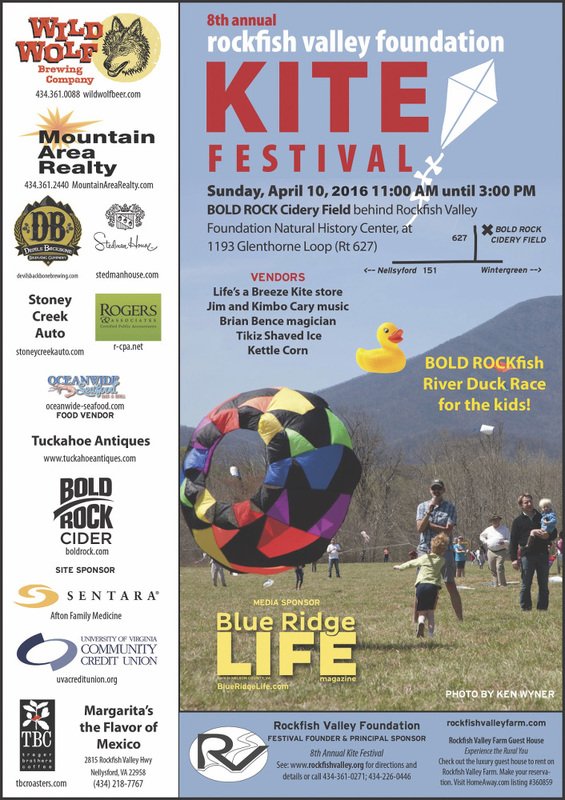 The 8th annual Rockfish Valley Kite Festival will be held on April 10, 11:00 – 3:00. Last year there were 1400 people. It is a free community event. Kite festival volunteers for parking, children kite assembly, and parachute races. A major initiative for 2016, this project is in addition to completion work on the Children’s Nature Trail. 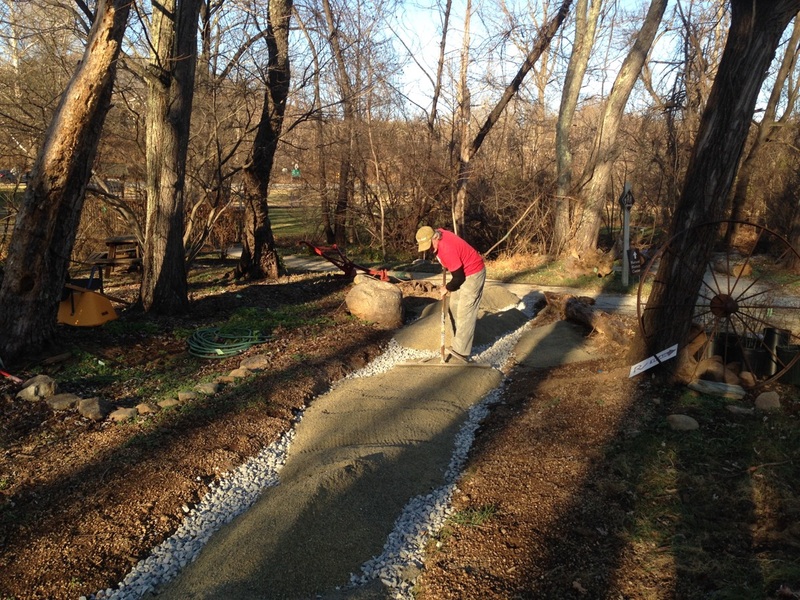 It is a 450 foot native plant walk being designed and installed along Spruce Creek. Our advisor is Fran Boninti and our landscape designer pro bono is Anne Henley. See link to her bio. This is the trail laid out by Zach Barnes and parts are up for adoption by families in the community. 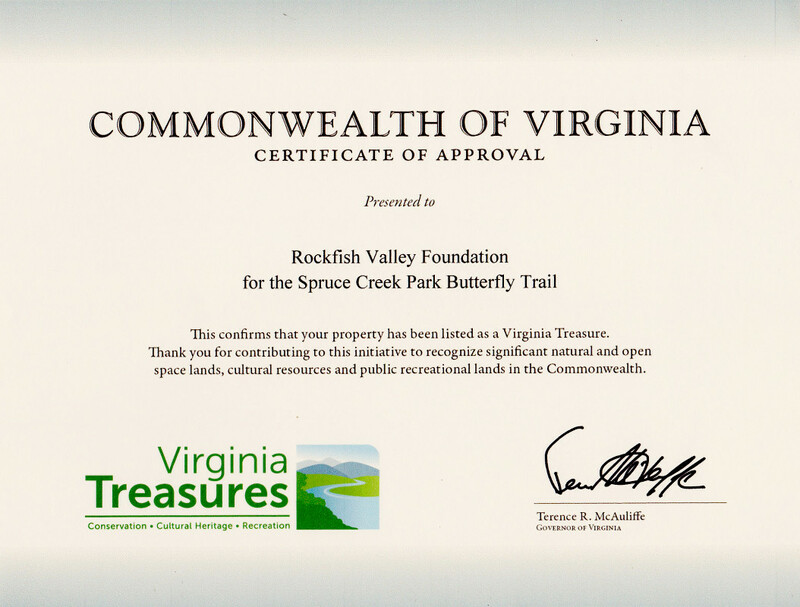 Here is a copy of the award we got from the Commonwealth and recognition of our butterfly walk.. And stay tuned as we are waiting to hear from Preservation Virginia on recognition of the Old Wintergreen Village and Coleman Mills as endangered places in the Commonwealth. This relates to our archaeology project and will occupy the community for 5 or more years as it develops. 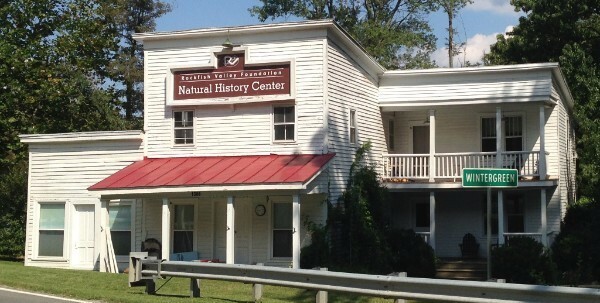 The trail and the archaeology site make up a 7 ½ acre site along Glenthorne, Rt 151 and Spruce Creek. Helping to install replacement brochure boxes at kiosks, install a brand new enclosed weather proof bulletin board on the porch of the natural history center, install brochure boxes on our tourist info center kiosk, and open and install new trail maps at the kiosks. Need someone with a good screw gun. Docent volunteers to take 3 hour shift, on a Saturday or Sunday from 10-1 or 1-4 with another volunteer in the natural history center. You help the visitor enjoy the experience in whatever way you feel comfortable. Adopt a plant and interpret once or twice a year a small section of the new native plant walk, or help maintain the Children’s nature trail in Spruce Creek Park. KITE FESTIVAL – volunteer to help with parking and or putting kites together for children at the kite festival which is April 10, 11:00-3:00 off Glenthorne loop. ACP Pipeline has suggested a route through Beech Grove at Blue Toad Cider, the ELK HILL meadow bottoms along the South Rockfish River and the walking trails, crossing 151 close to the downstream birding and walking trails over to Glenthorne Loop. That is within 500 feet of the ELK HILL residence, the Camille Trail head parking etc. If this is selected, the concern for those living in Horizons Village, Elk Hill and River Bluff would become a major issue. That is to be compared with the preferred route which destroys the Coleman Mills and Old Wintergreen Village archaeology site and newly recognized Butterfly trail as well as other natural and cultural resources which adjoin Bold Rock Cider. Not a pretty picture. But you need to know.